Posted on Sun, Mar 18, 2012 : 12:25 p.m.
Chicks, crafts and cookies await visitors to the 17th annual Spring Saline Craft Show, which serves as a fundraiser for the Saline Community Schools. In fact, nine youth groups from Saline Area Schools will use this as a fundraiser, said Cheryl Hoeft, organizer of the event. 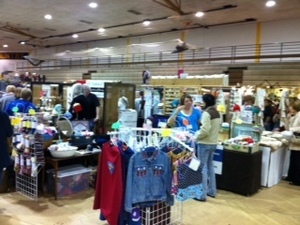 A scene from a recent Saline Spring Craft Show. The event takes place March 24 from 8 a.m. to 3:30 p.m. at the Saline Middle School, 7190 N. Maple Road. "The Spring Saline Craft Show is a great event that has something for all ages,” said Brian Puffer, director of community education for Saline Area Schools. “You can go shopping, bid on baskets at the silent auction, decorate a cookie, get your picture taken with Peter Cottontail and get a free caricature of yourself all in the same day,” he said. Admission is $2 for adults and free from children 5 years and younger, and no strollers will be allowed. More than 135 exhibitors from Michigan, Illinois, Indiana and Ohio will sell items such as baskets, jewelry, folk art, quilting, primitives, stained glass, ceramics, children’s and adult clothing, toys, silk and dried flowers, candles and furniture. Ducks are among the items that can be purchased at the Saline Spring Craft Show. There will be concessions, the Manchester Bakery will sell cookies, there’s a silent auction and Peter Cottontail will be available for photos, there will be free caricatures of children, as well as free children’s cookie decorating and arts and crafts in the cafeteria from 10 a.m. to 3 p.m.
Saline Community Education and the craft show also will sponsor a “Spring Gift Basket Contest,” through which groups and individuals are invited to prepare a food basket for any meal to be donated to Saline Social Services, Food Gatherers and Aid in Milan. Attendees will vote on entries at the show, and winners will receive a prize. For more information about the contest, click here. Baskets and proceeds from the contest will be donated to Saline Social Services and Aid in Milan. Free parking is nearby, and the show is handicapped accessible. Tue, Mar 20, 2012 : 4:09 p.m.